This 2015 Reading Challenge complied by PopSugar seems very feasible, for me at least. 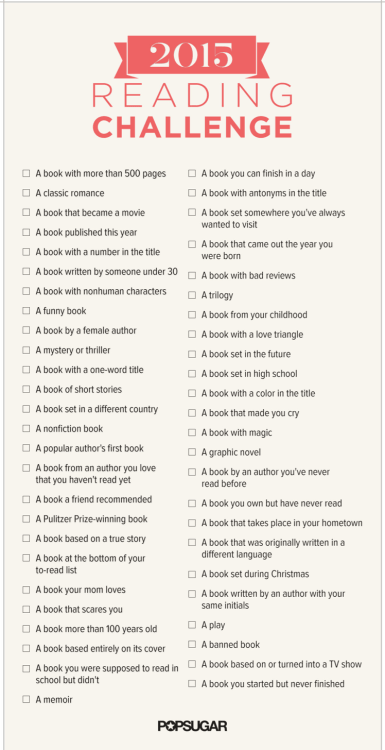 I’ve never been good with reading challenges, but I think I could accidently read a number of the books on this checklist. That’s another plus, is that its a checklist form. There’s nothing I love better than checking something off a list. I think I might print out a number of these to pass out at the library this month. What reading challenges are you signing up for next year?